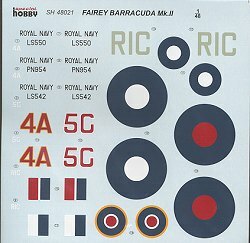 While many modelers will agree that this is a modernization of the infamous 'Farley Fruitbat', it is in actuality designed in response to Specification 24/37 for a carrier borne torpedo dive bomber. It was to replace the biplane Fairey Albacore that was in service and itself supposed to replace the even older Fairey Swordfish. 35 Mk Is were built and after working out a number of bugs, the more powerful Mk.II was the result. Approximately 1600 of this variant were built, the first squadron to receive the aircraft being 827 Sq and it was immediately put into action against the Tirpitz in Norway. Unfortunately they were unsuccessful in sinking her as it would take more than a few torpedoes. The death blow was delivered by Lancasters carrying 12,000 lb bombs! 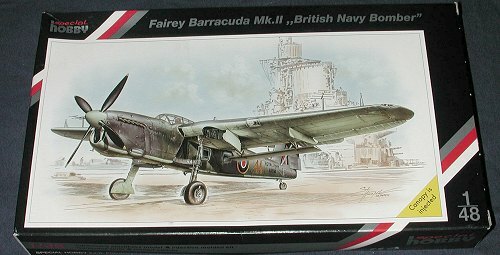 In addition to action in the Atlantic, the Barracuda was deployed on Indian Ocean and Pacific Fleet carriers for missions against the Japanese in the closing months of the Pacific War. Despite its looks, the Barracuda was a very successful aircraft and was not difficult to fly. The type went on to several other variants and plied its trade in various forms until the mid 1950s. 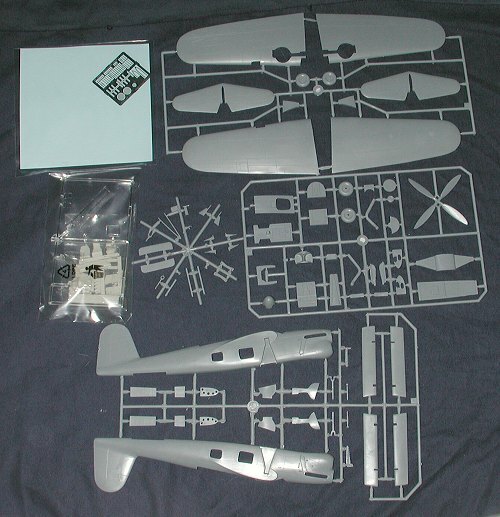 If you have built an MPM or Azur or Classic Airframes kit in the last few years, then this one will not be much of a surprise to you. What is nice is that Special Hobby has been moving away from vac canopies and more towards injected ones. The kit still relies on resin for a majority of the finer pieces, including much of the interior and this one also has a rather good-sized etched fret to go along with things. The plastic itself is well molded with nicely engraved detailing. There was little flash, no sink areas and only the usual ejector towers on the large parts; easy enough to remove if needed. As usual, there are no alignment pins and the sprue attachment points are somewhat intrusive into a few parts, so be careful removing them. A real boon to this reviewer is that the prop blades are all one piece! No more worrying over getting them properly aligned! YAY! I should mention that most of the etched bits are for various belts and harnesses. There are separate buckles (!) that most of us will cheerfully not use! The other etched bits are radiator grilles and ASV antennas. As I mentioned, most of the resin is for the interior bits. There are also resin exhausts. The tail hook assembly is a two piece deal where the hook itself is separate from the A-frame. I've done this type of thing before and it isn't easy to glue on properly. I'd have thought that the technology would be there to make this a single piece. The clear bits are in several parts, though the canopy cannot be displayed open without doing some cutting. These parts are nice and clear so one should be able to see any interior work done. No weapons are provided nor is there a torpedo crutch of bomb shackles though a torpedo crutch is shown on the box art. Instructions are quite good with the usual pictorial construction steps. Color information is given with generic names and Humbrol numbers. Markings are for three aircraft. All of them are in Dark Slate Grey/Extra Dark Sea Grey over Sky. There is the box art aircraft of 829 Sq aboard the HMS Victorious in mid 1944. Next is another 829 Squadron plane with different fuselage codes as used on the Tirpitz strike in 1944. Finally, a 814 Sq aircraft aboard the HMS Vengeance with the British Pacific Fleet in 1945. Decals are superbly printed and appear to be similar to (if not) Propagteam offerings so one needs to be careful in applying them. There are many modelers who will embrace this 'ugly duckling' with cries of glee. It is always nice to see another model that has previously been overlooked for the masses as has this one. It won't be a simple build ('cause of all the bits), but the end result should look quite good. It is already on my 'to do' pile.